Which lobby interface do you prefer? I'm curious which sort of lobby players prefer. Click on each to view screenshot examples to know the differences. 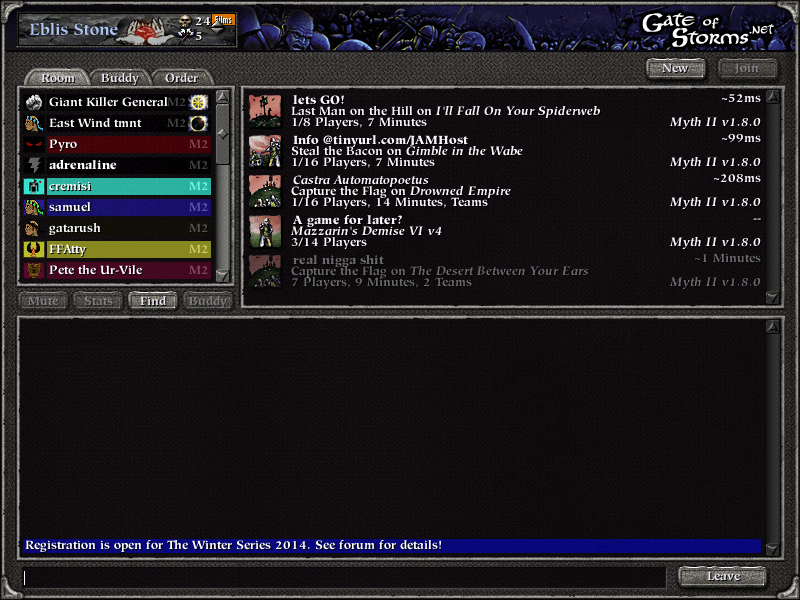 A few years back I made the long player list interface for obvious reasons. Once 1.8.0 came out I was able to switch to the expanded ones since they were not possible before. I prefer the expanded LPL one. If you didn't see them before, you can get them at the Tain. 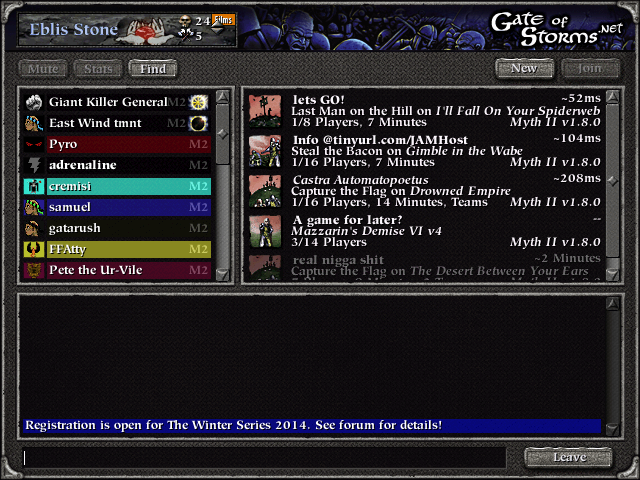 Re: Which lobby interface do you prefer? Expanded. I don't like the LPL ones. I cannot spam as much in the lobby. I don't need to know who else is in the room, that's what scroll is for. BIG KROK V8 SS wrote: Expanded. I don't like the LPL ones. I cannot spam as much in the lobby. You can spam the same amount. What you spam just gets split into 2 lines with the expanded LPL interface. Is the width of the chat area in the expanded LPL one the same as the regular interface curiously? That would seem like a nice setup. default... been seeing that same screen for so long, that anything else would feel weird. punkUser wrote: Is the width of the chat area in the expanded LPL one the same as the regular interface curiously? That would seem like a nice setup. So the expanded LPL's chat area is 89% as wide as default and 169% as tall as default. Most messages you see however never use the whole line. The few times there are such messages, they get split into two lines so you won't get anything cut off. The current blue bar messages, for example, don't get split up in the Expanded LPL. The original idea was to have the expanded LPL as the only option until a tester mentioned it was jarring to have the chat area start so far to the right when the field where you type is still in the left. So I kept both options. But it still left me curious as to other people's preferences to see if that was the exception or somewhat more of a norm. adrenaline wrote: default... been seeing that same screen for so long, that anything else would feel weird. You get used to it quick. Every time I go back to default, it feels the same as un-maximizing a web browser to a tiny window where you feel you still need to resize it to a bigger window. I've never felt the need to see more of the myth lobby though I could see the expanded interfaces being more useful back when there were full rooms and more dialogue... but i just don't see the need for it now, at least not for my purposes. adrenaline wrote: I could see the expanded interfaces being more useful back when there were full rooms and more dialogue... but i just don't see the need for it now, at least not for my purposes. Meh, as long as there is scrolling required (chat, players) I can see the point. 640x480 is pathetically small on monitors with resolutions exceeding 2k in each dimension and having to scroll is pretty silly. I still haven't switched to the expanded interface but that's more just due to laziness and minor concerns about how it interacts with the metaserver plugins... but it definitely makes sense. i definitely don't fall into that category hah. I'd consider switching if we consistently had 50 ppl in a room, but even then I probably wouldn't bother. 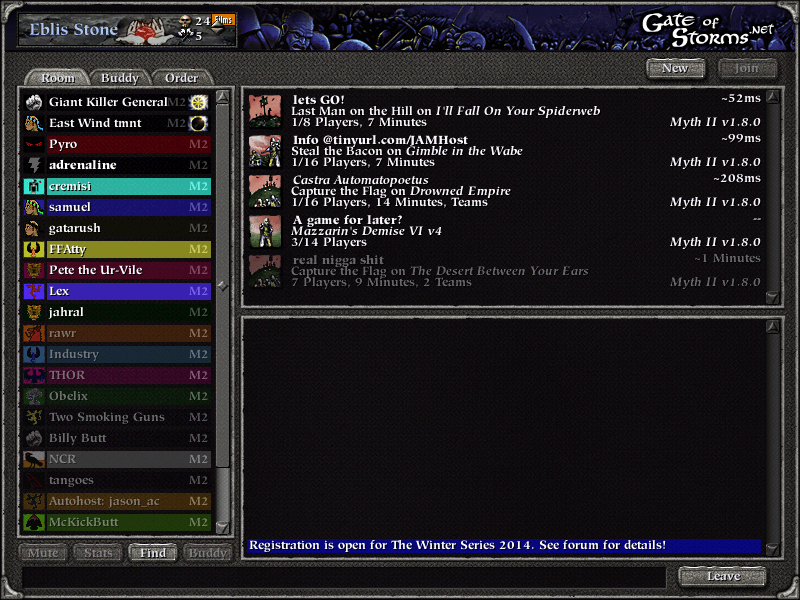 I logged on briefly last night and there were 10 ppl online... this was like 10:00 est... basically prime time. punkUser wrote: I still haven't switched to the expanded interface but that's more just due to laziness and minor concerns about how it interacts with the metaserver plugins. Minor concerns about how it interacts with metaserver plugins? Pfft. Maybe if the metaserver plugins and these interfaces were built by different people instead of the same person that would make sense. Punk, don't lie, it's just laziness. For many years I was stuck to a 15 inch monitor (not the same one but same size). It is not until a year or so ago that I made a switch to a wider monitor. Change takes lots of time it seems. Long ago I used to use Myth's lobby in fullscreen and the idea of using it in windowed mode in the 1.6.0/1.7.x days seemed strange and small. 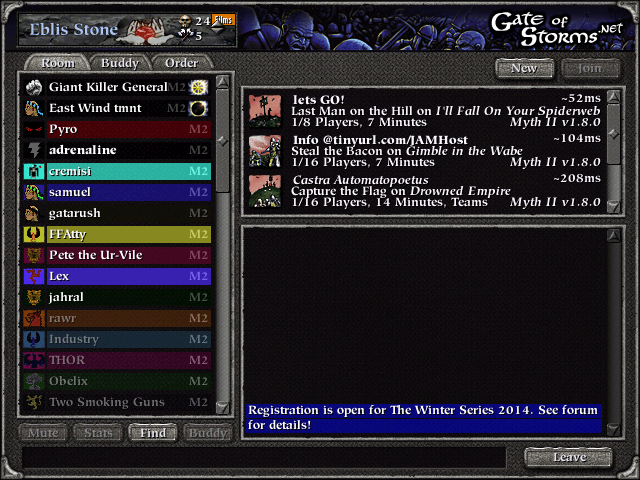 Now fullscreen for the lobby seems so wasteful and unneeded. It just gets in the way of other stuff you could do while waiting for a game. Later a bigger desktop resolution made the small 640x480 window too tiny. adrenaline wrote: I logged on briefly last night and there were 10 ppl online... this was like 10:00 est... basically prime time. Prime time being a fixed time seems a thing of the past these days. If you click on the "Metaserver" tab of this site at this moment (minutes away from 4:00 EST) you will see 20 players online with 1 of the 4 games having 10 players. Week nights seem to vary more these days but sometimes it gets to 20+, but not always. 10 is more than you can see without scrolling But it varies day to day - 10 is lower than usual lately. Weekends have been seeing 30+ for most of the time. I'll post some stats on games played, etc. when I get the chance. You are making an assumption that I care to see who is online! adrenaline wrote: You are making an assumption that I care to see who is online! LPL is the common misspelling when trying to say 'LOL'.